What sort of advent calendar do you have in your home? Do you like a traditional calendar or a modern one? Does it come with or without treats? We often have an advent calendar to help us countdown the days until Christmas. This year we are making a rather stylish homemade advent wreath that can be made by older kids and teens. The aim is to create a Christmas countdown that is full of meaning using a few simple words that we associate with the spirit of Christmas. Place the large plate on the cardboard and draw around it. Then place the smaller plate in the centre of this circle and draw around that. Carefully cut around both circles until you have a large hoop or ring. Cover the cardboard ring in glue and stick on the foil until the whole of the ring is covered. Next take the pre-punched crafting paper or paper doilies and cut out enough square to cover the whole of the foil covered wreath. 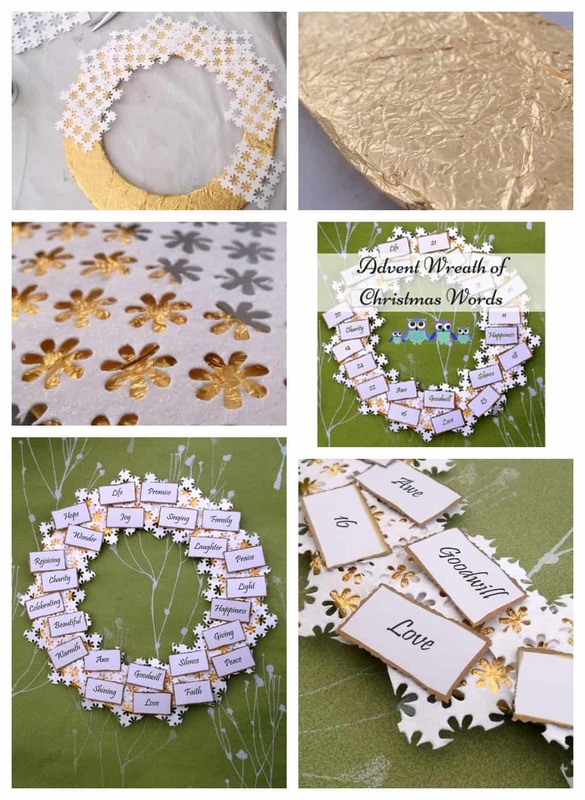 Glue these onto the wreath and allow to dry. 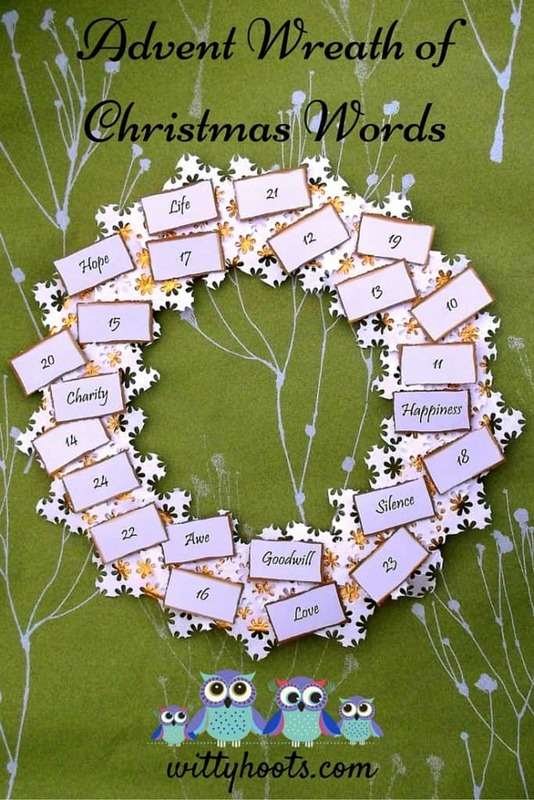 Select 24 words that have a Christmas meaning to you and your family. You can print these off or write these down on the white card. We made a table on our computer and just filled in the words we wanted to use. You can download our own Advent Words printable to use for free. Using the gold marker pen, draw lines to separate your words from each other. Repeat this on the back of the card where your numbers are if possible. Next, take your crafting scissors with a decorative edge, or pinking shears, and cut along the gold lines. You should end up with a decorative gold edge to your word label. Glue a loop of gold ribbon to the back of advent wreath so that it can be hung up. Finally, take some small pieces of white tack and add the numbered words to the wreath. Every day from the 1st of December until Christmas Eve, you can turn the numbered label over to reveal that day’s word and restick onto the advent wreath. This is a Christmas Countdown! Witty Hoots is excited about Christmas this year! We have joined in with others that are sharing some great festive ideas over the next few weeks. Check out the Christmas Countdown Advent Calendar Ideas below for more great ways to enjoy the build up to Christmas Day! Snowmen Advent Calendar by Rainy Day Mum. A simple advent calendar to make with the kids to hold either envelopes containing activities or a small gift each day of December counting down to Christmas. Avoid that morning sugar rush with a candy free way to countdown the days to Christmas with a Countdown Christmas Card from Peakle Pie! Winter Snowflakes Advent Calendar by My Bright Firefly shares a Christmas tree on the cork board: this simple DIY advent calendar features child’s favorite artwork and a poster puzzle and reveals a fun surprise a day. A free printable organizer. It will help you plan fun yet easy activities for any Advent calendar. How to Organize and Easy & Fun Advent Calendar by Books and Giggles. A great activity for siblings to hide secret messages inside each others DIY Christmas Tree Advent Calendars. DIY Christmas Tree Calendars by Crafty Kids at Home. Advent Elf Houses Countdown to Christmas are shared by Sun Hats and Wellie Boots. Printable Elf houses to explore during advent which build into a small world play scene! Oh what a lovely idea to make the countdown into a wreath! Love it! What a great idea for introducing new words, too! What a beautiful idea to make an advent wreath. I love that you’ve provided a printable of the words, too! Perfect! I’m making advent calendars for my teacher co workers. I always make something for them. This is quick and easy. And lovely and hopefully inspiring. Thanks for the words as well.